"An excellent book about an unjustly forgotten but important late-Victorian figure who did so much to explain the French to the British." 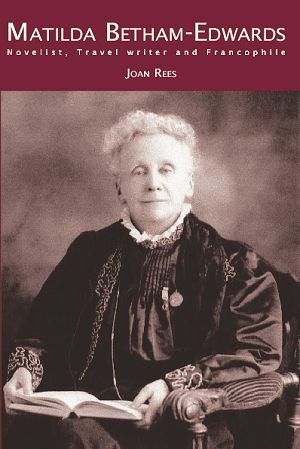 "A very interesting book about a fascinating woman who dedicated much of her life to the promotion of better understanding between the English and he French, giving also a shrewd insight into the history of women as they struggled for independence in the nineteenth century." This comment by the nineteenth century novelist and feminist, Sarah Grand, is an apt summary of the life and career of Matilda Betham-Edwards. Born to a farming family in Suffolk and always warmly attached to the flat countryside of her native county, she published her first novel when she was twenty-one and her last when she was over seventy. At all times she was thoroughly engaged with the concerns and leading personalities of contemporary life. She writes intimately of George Eliot and Henry James, among other major figures, and the impact of Darwinism is one of the subjects which she treats with acuteness and verve in both her autobiographical writing and her novels of contemporary English life. Her interests range widely but a major commitment of her life and work was to France and the French. Of Huguenot descent, she considered France her second native land and made it her mission to bring about better understanding and sympathy between the two countries who shared her allegiance. The French government made her an Officier de l’Instruction Publique de France in recognition of her untiring efforts towards the establishment of a genuine and lasting entente cordiale. She was awarded a medal at the Anglo-French Exhibition of 1908. Her relationship with her cousin, Amelia Edwards, author of A Thousand Miles up the Nile, is a continuing strand throughout her life and its history provides a fascinating insight into the personal strains on women of the period as they struggled for success and independence. Joan Rees is Emeritus Professor of English at the University of Birmingham.